Using a ready-made cake as part of a dessert can create an unusual meal as well as saving time and money in preparation. 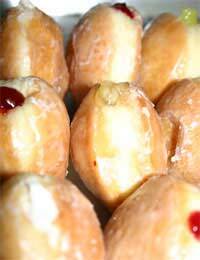 Doughnuts can be found in most supermarkets and bakers and with fillings as diverse as jam, custard or cream. Make each dessert in an individual dish as it can be presented without breaking up and will look spectacular in the dish. If making this dessert for younger children or for adults who would not normally heat a large doughnut try using the mini doughnuts that are found it supermarkets. This dessert can also be made using the remains of a Victoria sponge or even a few leftover slices of rich fruit cake. Even stale cake can be utilised for the recipe and is an ideal way to use up leftovers. If the cake is dry add a little jam between the slices of the cake in each dish. This recipe can be made in advance and left in the freezer. It is a stunning addition to a dinner party menu that will have people talking as most enjoy a donut but would never think to add it to a meal. Preheat the oven to 220 degrees C, gas mark 7 so it is ready to cook the dessert. Place the doughnuts in four individual heat proof dishes. Cover with a thick layer of the ice cream and place into the freezer for thirty minutes. Place the egg whites into a clean bowl and whisk either by hand or machine until the whites are thick and stiff. If you shake the bowl the egg whites should not slide about but remain in stiff peaks. Add the sugar gradually until the mixture is thick glossy and still stands in peaks. Remove the individual ovenproof dishes from the freezer and divide the egg white mix between the four bowls. Make sure that the meringue mix completely covers the ice cream and donuts and goes right to the edges of the dish so that the ice cream is not melted by the heat of the oven. Put the four dishes back into the freezer for fifteen minutes. When ready to serve remove the dishes from the freezer and place straight into the preheated oven on the top shelf. The peaks of the meringue just need to brown before serving. Use a good quality thick ice cream for this recipe as it needs to stay as solid as possible during the cooking process. Try to avoid the ice creams advertised as soft or the ones that have ripples of fruit running through them as they will melt really quickly. If using slices of cake rather than a donut, sandwich them together with a chocolate and hazelnut spread before covering with a good quality chocolate ice cream. If this recipe is to be served for a dinner party try piercing the doughnut with a fork and drizzle a little brandy or a liqueur as an added surprise.